Tomorrowland, a film by Brad Bird, has the audacity that few movies, particularly science fiction films, possess in our modern age. It chooses to view the future with optimism, directly challenging the viewer to look at the problems of the world and find a way to fix them. The message delivered by the villain of Tomorrowland in the third act of the film, Governor Nix played by Hugh Laurie, argues that humanity prefers to simply sit back and relish visions of their doomed future. The positive counter argument, embodied in the teenage heroine, Casey Newton (yes, her name is Newton, we see what you did there) played by Brit Robertson, is hammered home in her relentless spirited approach to the world as something with problems that can be saved. Ultimately, one’s enjoyment of Tomorrowland rests on one’s perspective of the future: one where humanity is stuck on a rollercoaster of unavoidable destruction of its own devising or is it one where the human race has the power and creativity to build a better world. 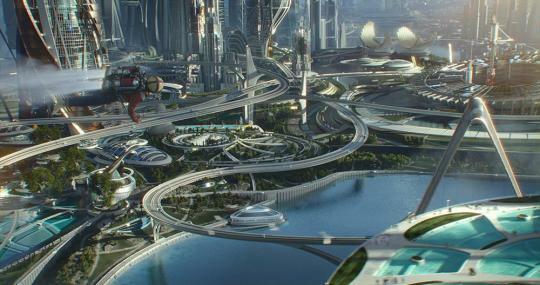 For those in the latter category, Tomorrowland will be an enjoyable, if not invigorating movie to sit and behold. For those in the first category, they likely already knew they were going to dislike it before they found their seat in the theater. The film opens with George Clooney narrating into the camera, egged on by an unseen voice, to be less dour and more positive. Clooney grudgingly recounts an event from his boyhood, where as an aspiring jetpack inventor, he had trudged his way to the 1964 World’s Fair in New York City. Once there, he meets a girl who passes him a Tomorrowland pin and advises him to follow her and her presumed father onto a Disney ride at the fair. He does so and finds himself transported to a futuristic city, a veritable heaven for Clooney’s younger self who envisions inventions that are fun, rather than pragmatic, as valuable as any others developed for specific purposes. His happy symbolic homecoming abruptly ends as Clooney complains that the story turns grim from that point onward. He challenges the unseen voice to take over and a young woman steps into the frame, Casey Newton. Our hero is introduced as a saboteur of the heavy equipment put to use in demolishing the launch pad at Cape Canaveral. Her vigilante acts serve not only to protest the abandonment of shuttle flight, but more directly to keep her father, a NASA engineer, employed. Unbeknownst to Casey, she has been under surveillance by a shadowy figure who plants the much advertised “T” emblem pin in her belongings, where it is later swept up by the police when Casey’s luck runs out avoiding the law. The pin comes to her attention as she’s bailed out of jail and upon her touch, transports her to a field of grain with a majestic city of the future in the distance. She experiences several of these trips, learning the hard way that she may appear to be in the future, her body remains bound by the physical environment which surrounded her prior to her visions. After a lengthy trip which leads her to a tour of the city, the advanced technology and the promise of a ride upon a rocket to the stars, Casey resolves to find the truth behind the pin and the city of the future. Her investigation leads her to a Sci-Fi Collector’s shop with two odd merchants who come across as very interested in the provenance of Casey’s pin. When Casey fails to provide the name or source of the pin, the husband and wife shop owners pull out the equivalent of blaster guns and attack. Shocked and definitely not prepared for this turn in events, Casey struggles to stay alive and was at the literal point of becoming toast when a tween girl appears like a personal savior and defeats the shop occupants. Her name is Athena and she’s the same girl who lured the young George Clooney to Tomorrowland. Quickly, Athena takes the dubious Casey on a road trip to the somewhat dilapidated home of Clooney’s character, Frank Walker, an exile of the fantastic city. In their wake and soon in hot pursuit, are a van full of slightly unnatural men and women, wielders of blaster guns used to kill a local sheriff and deputies. At Frank’s house, Casey is immediately told to leave by a curmudgeonly Clooney, but remains resolved to find her way to the city of the future. The pairing of Clooney and Robertson works by the formula of opposites, with Casey the bright optimist clashing with Frank, a dour pessimist who is soon revealed to believe that the end of the world is only a month and a half away. The unnatural men, revealed as robots, attack the house and Frank finally agrees to take Casey to Tomorrowland after she somehow affects the probability of the end of the world on his devices. In a trip that involves a flying bathtub, personal teleportation and then a rocket ship built under the Eiffel Tower designed to pierce dimensions, not the depths of space, Casey, Frank and Athena finally arrive at the much hyped city of the future. By this point, a short history had been provided, as the city had been a place where the brightest scientists and the most creative artists had settled and allowed optimism to guide them in building a miraculous future years before our own society made similar technological feats. At the time of the 1964 World’s Fair, a plan had been set in place to introduce the city to the world at large, but that promise of an amazing future had failed to come to pass. The city that greets Casey is an empty one, nearly tomblike and absent of crowds of happy, smiling people living in a future where the boundaries of human invention are limited only by the imagination. Instead, the trio are immediately apprehended by Hugh Laurie’s Governor Nix, who has the intention of quickly returning them to Earth. Before this happens, we learn that Frank, prior to his expulsion, had invented a machine that allowed the user to see the future. The invention’s ability had immediately resulted in the discovery that the world meets an apocalyptic end. In an attempt to warn the inhabitants of the Earth, Nix instructed the device be designed to broadcast the message of doom subconsciously into the minds of the human race with the hope it would serve as a call to action to change the fate awaiting them. To Nix’s disgust, humanity simply did nothing except revel in their doomed behavior. The plan to invite the people of Earth to Tomorrowland was soon scrapped out of fear that humanity would destroy the city of tomorrow in the same manner they had destroyed the Earth. From the safety of another dimension, Nix planned to watch the end of the human race, convinced there is nothing to do but watch fate unfold. Against this pessimistic perspective is Casey’s opposition, bolstered by Frank’s support. Along with Athena, the three conspire to destroy the device, believing that its broadcast of a doomed future has handicapped humanity’s ability and ambition to fix the problems which plagued the world. In this clash of positivity and negativity, our champion Casey, along with Frank, emerge the victors. They stop Frank’s invention, save the world and step into the role of the new spiritual leaders of Tomorrowland. Under their leadership, they put back into operation the plan to invite the best and brightest to the city, promising not just a revival of Tomorrowland, but the belief that it belongs to the human race as an inspiration to pursue a better future. It’s very easy to make allusions to Galt’s Gulch, Ayn Rand’s secretive paradise of capitalists and inventors in Atlas Shrugs, who build a fantastic world with the promise that as the wider world around them collapses, to save it, when examining Tomorrowland, a fantastic city built by those gifted in science and art. The comparison falls apart for several reasons. First, the city is founded by those who desired the freedom to pursue their dreams and interests, but that desire was not based out of any perceived limitations placed upon them in the wider world. Second, the intention was always to bring the bounties of Tomorrowland to the human race. It was only when it seemed the world was doomed that an authoritarian leader (elected? This is never made clear.) deemed the plan a risk to the continued existence of the city that it’s shelved. Brad Bird rose to fame as an animator and director at Pixar. His animated film resume notably includes a shared theme of celebration an individual’s gifted attributes, but never at the expense of others. Iron Giant’s protagonist is an odd boy who fails to get along with other kids his age because of his fascination in sci-fi. The Incredibles celebrates a family of super powered individuals who find happiness embracing their amazing abilities to help others with an antagonist who uses his gift of invention (a Mirror, Mirror universe version of Frank Walker?) not to create fun in the world, but to equalize society out of selfish reasons against the super powered. Then finally, Ratatuille, a film about a gifted rat who loves to cook and perseveres to open his own restaurant against everyone’s expectation that a rat in a kitchen better be in a trap, if present at all. Thus, Tomorrowland draws upon this belief that those who are gifted should use them to better the world. It’s a wider application, no longer pinpointed on an individual’s happiness, but what an individual can do as part of a society that they willingly step forward to help and improve. The world can be a better place, Bird argues, if humanity stops accepting things the way they are, and make the decision to pursue a better future. It’s the dream of a future that always improves, something Americans, in particular, have held almost with religious affirmation until the 1970’s when the consensus began to fall apart. One might argue it peaked in the 1960s, enshrined by the spirit of the World’s Fair in 1964, but also how the set, costume and world design of Tomorrowland, reflect a very 1960’s science ficition aesthetic. Our hero, Casey, is physically transported to this optimistic belief, serving as our present day bridge to the dreams of a better tomorrow from our past. 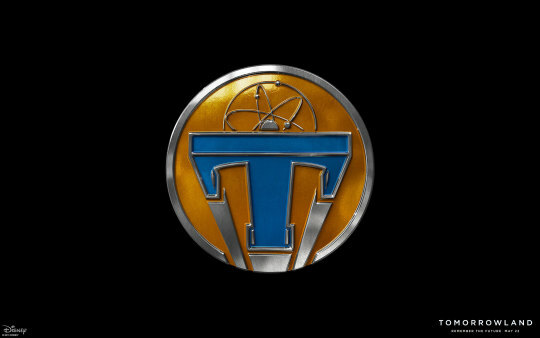 While it seems that our teenage heroine implies that this optimism is a torch for the Millenial generation, the movie ends with a view of hundreds of people being offered views of Tomorrowland via new “T” pins, among them people of all ages.